Carl Rungius was primarily known as a painter of big game. 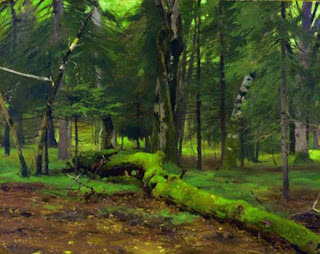 His fidelity to painting directly from life cannot be ignored and puts him at the top of the list as an outdoor painter. 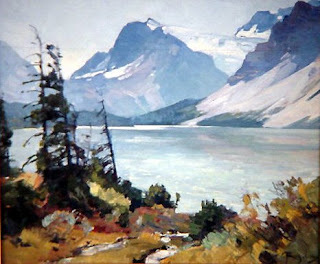 His depictions of the Canadian Rockies have not been surpassed to this day. Carl Rungius was born in Germany in 1869. From an early age, he was determined to become an artist. His father, a pastor, wanted him to become a minister, but the young Carl refused and his father eventually relented. He studied at the Berlin Art Academy. Carl was enrolled in design and figure classes but found time to sketch at the zoo. Eventually, he assembled a portfolio of animal drawings and submitted them to Paul Mayerheim, the professor of animal drawing and painting at the Academy. After studying at the academy, Carl stayed with his parents. His prospects for a successful career in art seemed slim until he was invited to visit his uncle in America. The trip would change Rungius’s life forever. At a sportsman show in New York, Carl met Ira Dodge, a Wyoming guide. Dodge invited Carl to come to Wyoming to experience American big game, first hand. This invitation was the opportunity the young painter needed. He would often make studies from the animals he shot—posing them with ropes back in his camp. In New York, William Hornaday, the first director of the New York Zoological society, discovered Rungius. Hornaday introduced the artist to the wealthy patrons who were critical to Runguis’s success in his career. Hornaday was responsible for many of Rungius commissions in the following years. He also introduced him to the lucrative world of illustration, which was in its golden age. While Carl was living with his uncle in New York he became close with his cousin Louise. After she graduated from Columbia University, the two married. Carl Rungius was concerned that his focus on wildlife was hurting his reputation as a serious painter. 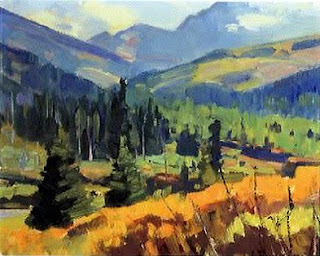 To remedy this, he began focusing on the landscape and entering national shows. His trips to the Canadian Rockies helped influence this change of focus. As he matured, Rungius changed his painting style, moving away from the academic approach he was taught in Germany. His palette lightened and he incorporated many aspects of Impressionism into his painting. Carl Rungius died of a stroke at his easel in 1959. 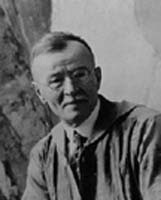 Wilhelm Kuhnert was born in Germany on September 28, 1865. At the age of seventeen, he traveled to Berlin to stay with relatives and enroll at the Royal Academy of Berlin. While at the Academy, he studied Animal Painting under Paul Meyerheim and Landscape Painting under Ferdinand Bellerman. Although considerable attention was paid to studying anatomy, the students would sketch captive animals in a zoo and then make formal paintings in their studio—making up the environments from the artists’ imagination. Kuhnert decided to change this. After seeing some African animals at a fair, the young artist vowed to travel to Africa and paint animals in their native habitat. Upon leaving the Royal Academy, he acquired a studio in Berlin. While Kuhnert was sketching at the Berlin Zoo, he was introduced to Hans Meyer, the first European to climb Kilimanjaro. Meyer was impressed with Kuhnert’s ability and promised the young artist the chance to illustrate his next book. 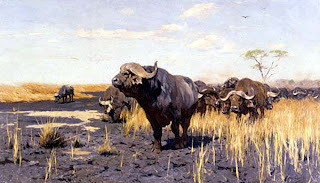 Kuhnert told Meyer of his goal of traveling to Africa to paint the animals in their natural settings. Meyer suggested he travel to East Africa and even gave Kuhnert his safari equipment. Good to his word, Meyer commissioned Kuhnert to illustrate Brehms Tierbuilder, a dictionary of animals from around the world. With the proceeds from the book, Kuhnert traveled to Africa in 1891. At that time, the East African Colony was a vast, unexplored territory for most Germans. Kuhnert traveled the only way available—accompanied by a score of men to act as guides and carry the hundreds of pounds of gear and supplies needed for such a journey. A year later, he returned to Germany with dozens of paintings, sketches and drawings of the African animals, people and places. In 1893, Kuhnert’s paintings went on display at the Berliner Art Exhibition and he took the Medal of Honor. The public responded to his truthful depictions of the great continent. At only 28 years of age, Kuhnert’s success seemed assured. He married in 1894 and moved to a larger studio. The attraction of Africa could not keep him home, so in 1905, he left his wife and daughter and returned to what he called “The Promised Land”. After a year on the continent, rather than returning home, he traveled to Ceylon. Unable to stand his long absences, his wife left him in 1907. Kuhnert finally returned to Germany in 1908. He returned to Africa once more in 1911. Two years later, he remarried. In 1920, Kuhnert published two books on African Wildlife—“Im Lande Meiner Modelle” (in the Land of My Model) and “Mein Tierre” (My Animals). He died February 11, 1926 at the age of 60—five months after his second wife had passed away. It is believed Kuhnert’s body of work totaled 5,500 paintings—primarily animals, but also portraits and landscapes. Today, there are less than a thousand known works in existence. The rest of his paintings were destroyed or lost in World War II. Anders Zorn was born in Mora, Sweden on February 18, 1860. Although his mother never married Zorn’s father and Anders never met him, Anders was acknowledged and allowed to carry his father’s name. His grandparents raised Zorn. At the age of 15, Zorn attended the Royal Academy in Stockholm. His initial interest was sculpture, but he later switched to watercolors. In 1880, one of his watercolor paintings was recognized at the student exhibition. This introduced him to Stockholm society and many commissions soon followed. Zorn married Emma Lamm in 1885. 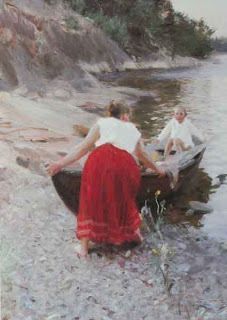 In 1887, the Zorn’s spent time in St. Ives in Cornwall, England. It was here he changed his medium to oils. 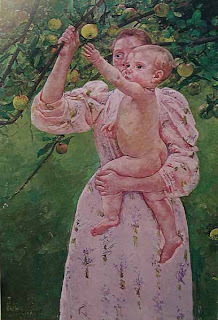 His second oil painting was exhibited in the Paris Salon of 1888 and was bought by the French State. Zorn’s oil portraits launched him into international acclaim. The use of a limited palette of red, yellow, black and white added an economy and unity to his paintings. His ability to capture the individual character of his models and his bravura brushwork attracted many patrons. Zorn also embraced naturalism; painting models outdoors or in natural settings for the sitter instead of the artist’s studio. In 1893, Zorn was chosen to supervise the Columbian World Fair in Chicago, Illinois. This was the first of many lucrative trips to the USA for Zorn and his wife. He received many portrait commissions from American society—including several Presidents and Isabella Stewart Gardner, the most prominent American art patron of the time. In 1896, the Zorn’s returned to Sweden and began to build Zorngarden in Mora. The Zorn’s helped to preserve folk culture of Mora, establishing a music contest and schools in the area. Zorn is credited with creating a folk music revival in Sweden. Zorn was also a successful sculptor and etcher producing nearly 300 etchings in his career. Zorn died on August 22,1920. Emma survived Anders by 21 years. She created a museum in his honor and continued the philanthropic work to preserve the ancient culture of Dalarna, and the folk dialect and traditions of Mora started with her husband. Mary Cassatt was born in Allegheny City, (Pittsburgh) Pennsylvania in 1844, the daughter of Robert Simpson Cassatt and Katherine Kelso Johnston. Cassatt’s father was a stockbroker and real estate investor. 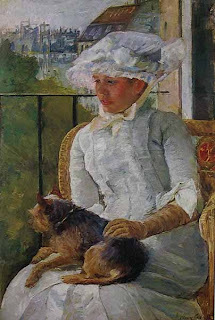 When Cassatt was seven, her family moved to Europe—first living in France and then in Germany. They returned to America in 1855. Cassatt enrolled in the Pennsylvania Academy of Fine Arts in 1861. After four years, Cassatt became dissatisfied with the curriculum at the Academy and decided to pursue independent study of the Masters in the museums of France, Italy and Spain. In the 1860’s, this decision was unthinkable for most Victorian women born into a well-to-do family. The idea of women pursuing a career—let alone a career in art—was vulgar to most of society and would have risen more than a few eyebrows. Cassatt prevailed over her family’s protestations and moved to Paris. In Paris, she briefly studied in the Atelier of Charles Chaplin and then studied on her own. In 1871, Cassatt fled France at the outbreak of the Franco Prussian War and returned to America. Later, she moved to Parma, Italy where she studied engraving at the Parma Academy. While in Italy, her first painting was accepted into the Paris Salon under the name of “Mary Stevenson”. In 1874, she returned to Paris. Cassatt admired the work of Manet and Degas. Although she continued to submit to the Salon, she was sympathetic towards the goals of the younger artists. These artists sought the right to freely exhibit their work without the restrictive jury process followed by the salons. In 1877, she was rejected from the Salon Show and never submitted again. Cassatt later met Degas. He admired her work and invited her to show with the Impressionists. She participated in four Impressionist shows–the only American to do so. 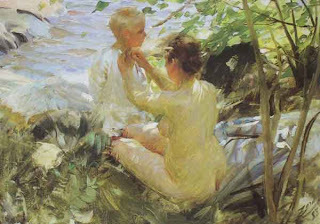 Cassatt focused on capturing modern women in natural settings. Her strong composition and drawing skills set her apart from most of the other Impressionists. She was a fine printmaker and produced groundbreaking work in that field. Cassatt was instrumental in seeing that Impressionist’s works were collected in America. She helped build the Havemeyer Collection which contained many fine examples of Manet, Monet and Degas work. In 1892, Cassatt created a mural for the Chicago Columbian Exhibition. With the sales from her second One Woman Show, Cassatt bought a 17th Century Manor in the Oise Valley in France. It became her summer home for the rest of her life. Mary Cassatt developed cataracts in 1915, forcing her to abandon her painting the last ten years of her life. She died in 1926. Frederick Childe Hassam was born on October 17, 1859 in Dorchester Massachusetts. His name (pronounced HASS um) is a corruption of the English surname Horsham. In his late teens, Hassam worked as a wood engraver. He later pursued illustration while attending the Boston School of the Museum of Fine Arts. In 1882, Hassam presented his first of many Solo Exhibitions. This show, which contained over 50 watercolors of New England landscape subjects, was held at Williams and Everett Gallery in Boston—one of the city’s oldest galleries. In 1883, Hassam made his first trip to Europe. On his return to Boston, Hassam held another show at the Williams and Everett Gallery with more than 60 watercolors from his travels. Hassam was married in 1884 to Kathleen Maude Doane and the couple moved to Boston’s South End. It was here that Hassam began to paint the city motifs for which he would become famous. These early paintings, while not true impressionism in execution, shared the same concern for modern subject matter. The paintings show more consideration for subtle tonal variations than bright color. With the critical success of his paintings and a steady income from illustration, Hassam decided to go to Paris in 1886 for further study. He and his wife settled in Montmartre near Paris and Hassam enrolled in the Academie Julian where he studied under Jules LeFebvre. After a year and a half of study, Hassam was dissatisfied with the Academie. He turned his attention to exhibiting in Paris and displayed his work at the Paris salons of 1887 and 1888. Participating in the Exposition Universelle of 1889, he received a Bronze Medal. In 1889, Hassam and his wife returned to America. He was 30 years old. 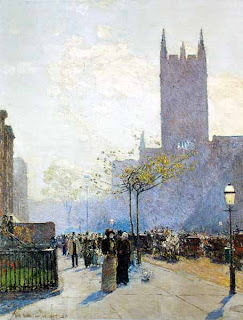 Hassam and his wife moved to New York City. 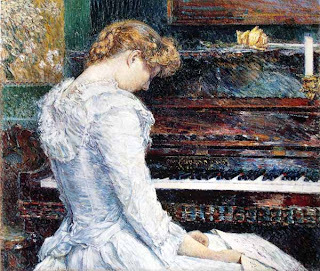 Hassam became active in many art organizations. He founded “The Ten” which included Willard Metcalf, William Merrit Chase and Frank Benson, among others. Although Hassam downplayed his European experience, it significantly affected his painting style. Hassam’s brushwork became more broken in application and his palette lightened. Hassam was considered the foremost proponent of American Impressionism during his lifetime. He garnered critical acclaim as well as great financial success. After World War I, Hassam’s finest paintings regularly sold for $10,000 or more and his income from painting sales was rumored to be $100,000 in 1920. He died in East Hampton, New York in 1935.